Arizona Walk Shop has maintained a commitment to friendly service and premium quality products since 1990. From the day we opened for business, our philosophy has been that the customer always comes first. We are completely dedicated to customer service and a fast turn-around time on all orders. Moreover, a trained fitter is always available to answer any questions, or to help you determine the appropriate product for your special needs. Your comfort and satisfaction is very important to us. We have created this website to provide you with the information and products you need to experience immediate comfort and relief. Additionally, we welcome your input. Arizona Walk Shop invites you to e-mail, call, or visit us with any questions, concerns or comments that youd like to discuss. Every day youre on your feet, walking approximately 7,000 to 10,000 steps. With each of these steps you place significant pressure on your feet. In fact, a recent study indicated that three out of four Americans experience a serious foot problem at least once in their lifetime. At Arizona Walk Shop, we believe that no matter how much youre on your feet, your life should be spent in total comfort. 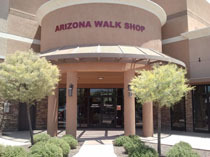 Arizona Walk Shop knows how to comfort your feet so you can enjoy all the activities life has to offer. We are proud to carry the very latest in upscale foot health products that include orthotics, supports, insoles, specialty footwear, and pads providing relief with the latest gel technology. Our diverse footcare line offers you immediate comfort from almost every foot condition including heel pain, arch pain, ball-of-foot pain, bunions, hammer toes, diabetes, arthritis, and more. These unique foot health products are available to you immediately, and at an affordable price to meet your needs. We would like to invite you to visit our facility to meet our staff and discuss how we can help you with your healthcare needs. While visiting, ask one of our trained staff members for a free foot analysis. Please feel free to call us for directions. We look forward to meeting you!